It’s been a rough and tough atmosphere for all and sundry since 2015 till date hence, frustration has gripped the heart of many which have ignited their desperation to a 101% level turning even the supposed most ‘educated’ lots foolish and stupid in matters where common sense should be applied. The wave of elections is on the air once again in the enclave called Nigeria, heralding another four years of subjugation and slavery; a period when the hallowed slaves files out in their numbers to decide who next becomes their slave master without thinking out the modalities to become free for the rest of their lives. The frenzy and echoes of political parties and their candidates has become the other of the day that the dead (Nigerians) suddenly appears not to remember how they got to where they are presently and how it all happened before they arrived at their present predicaments rather they have decided to wave away the lessons of the past and that which is trespassing now to sing another song of “ATIKULATION” after shouting “Sai Baba” which will still bury them in TRIBULATION in no distant time. Since I grew up, I have always heard that change is the only constant phenomenon in life whereas other things are perhaps static but I as well have never seen or heard that the devil changed rather the devil have always proven it’s static nature in applying different strategies to making people forget the pains it afflicted them in the past by falsely presenting a rosy future of total destruction before them (the case of Buhari and Atiku during the 2015 and 2019 elections respectively). Common thought would have told anyone who cares to understand that no Nigerian politician have the populace in mind nor has the magic wand to turn things around. All they do is to capitalize on the mistakes and/or failures (incompetence) of the incumbent to lure the people into believing or supporting them by offering the people some mouth-watering promises without a prototype on how to go about or achieve such promises. 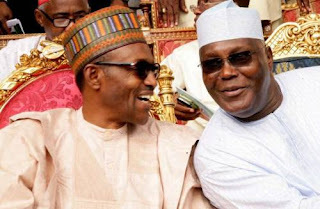 Atiku have come to sing the song of restructuring which John Nnia Nwodo, the president of Igbo sociopolitical group, Ohaneze Ndigbo, taught him without properly defining the type of ‘Restructuring’ he would likely embark on just as Buhari and his cohorts sang the song of ‘Change’ as was introduced by Bola Ahmed Tinubu, the patron of All Progressives Congress (APC) party in 2015 which landed Nigeria into the list of countries suffering from poverty and recession today. Whereas the Atikulated Alhaji Atiku Abubakar, the current Peoples Democratic Party, PDP’s presidential flagbearer for next year’s election is busy singing the song of ‘no prototype’ Restructuring. Many of his timid supporters who are unemployed graduates are busy singing the song of employment hoping that he is setting in to create employment opportunities for them to seat under air-conditioned rooms as employees; forgetting that before now, the man, Atiku owns so many firms (Intel inclusive) that are capable of employing many of the suffering unemployed youths both inside and outside Nigeria but how many times have his company advertised for an open, free and fair employment since it’s establishment? If your answer is on the negative, what then makes you think that he will change even when he becomes the president? No wonder Buhari referred them as “Lazy Nigerian Youths”. It is high time all the people entrapped in this British business container called Nigeria start to reason with their brains and fight for a way to break the chain of colonization that Britain left hanging on Nigeria’s necks by unanimously demanding for a true internationally supervised Referendum as demanded by the leadership of the Indigenous People of Biafra (IPOB) to earnestly know the mind of the common man in Nigeria. Nigerians all over the world are seen differently from other citizens of the world as evil and dangerous people to be with only because of the greedy nature and stupidity of the Nigerian political class, yet the people even the so-called elites have chosen to live with such stigma instead of standing out for the truth for the benefit of all. Youths on the other hand have been mowed into selling their future for political crumbs by turning them into political thugs, killers and criminals as would be witnessed in no distant time as election days approaches. Freedom is the most valuable gift anyone can get on earth, so therefore, let everyone join hands with IPOB to secure freedom for all in Nigeria and Africa at large. #Say yes to Referendum for Freedom of all.